A Monthly Journal of Mystical and Philosophical Research / Monthly Journal of the Ancient Wisdom-Religion. Loudsville, GA, and Glasgow, then Edinburgh, Scotland. Publisher: Peter Davidson; Bernard Goodwin (Glasgow); John Walsh (Edinburgh). Editor: Peter Davidson. 1/1, May 1892-1910(?) 8-24 pp (varies). 10 cents a copy. This "succeeded" The Occult Magazine in the sense that Peter Davidson (1837-1915) was the editor of both. As his interests changed from the H.B. of L. to the Ordre Martiniste, the Union Idéaliste Universelle, the Tradition Cosmique of Max Theon, and the Christian mysticism of Holden Edward Sampson ("Light," 1859- ) , so did the journal's content. It was the organ of Davidson's and Sampson's Order of the Cross and Serpent and, from 1905, of the the Tradition Cosmique of Max Theon. 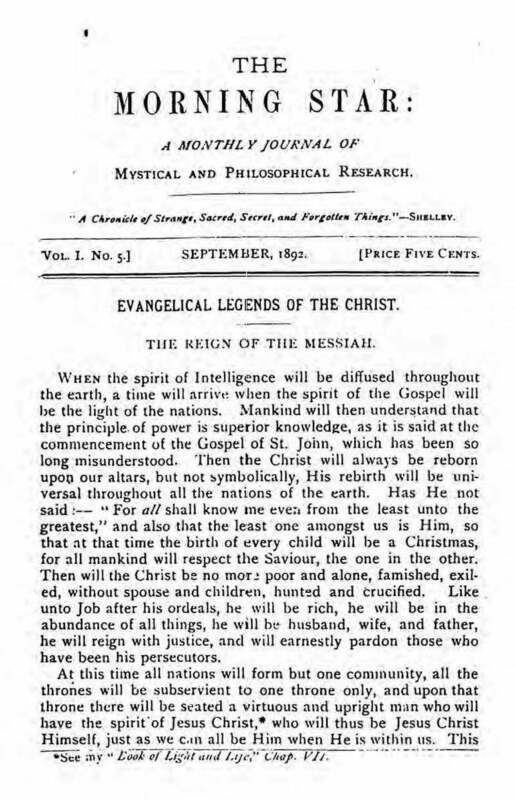 S.C. Gould, Arcane Fraternities in the United States (Manchester, NH, 1905), 7, says that this is "a journal for the proclamation of the Mysteries and Lost Truths of the Ancient Wisdom Religion of Jesus Christ." Davidson and his confederate in the H.B. of L., T.H. Burgoyne, fled Britain after the exposure of the brotherhood's fraudulent colony scheme. Davidson ended up in Georgia and seemingly took no part in Burgoyne's attempts to revive the organization in the United States but remained active in advising its members in France. He was, nonetheless, influential in America, reviving connections from his days as Grand Master of the North of the H.B. of L. or making new ones among the inheritance of P.B. Randolph and the H.B. of L. The journal advertised Hiram Butler's Esoteric, Charles Mackay's Oracle, George R. Charles's Christian Metaphysician, Parsival Braun's New Man and Der Meister and The Mastery of Fate, George Chainey's Interpreter, Cyrus R. Teed's Flaming Sword, the Temple Artisan, R.S. Clymer, S.C. Gould's Notes and Queries, Franz Hartmann's Sphinx, etc. Duke University microfilm; House of the Temple, Washington, D.C.; LOC.